The Dublin sales and marketing team had a very successful week of meetings, workshops and strategic planning sessions at ViaSat Inc.’s corporate headquarters in Carlsbad, California last week. All eyes are on AIX 2017 (Hamburg, Germany, 4 – 6 April 2017), as a platform to tell the aviation world the compelling story of how ViaSat in-flight internet and onboard entertainment enables the accelerating trend towards personal device entertainment and complements our suite of operational apps. This is a big story, as you can tell. Luckily, the acquisition of Arconics by ViaSat brings together a wide selection of great people, skills and resources, plus a unified vision that helps bring us closer every day. The vision is all about delivering the best possible value to our customers and enabling the world’s greatest airlines to resolve a wide variety of challenges with in-flight internet, wireless IFE and operational apps. never a dull moment, with private jets and small aircraft flying by every few minutes. The team there is so welcoming, we felt right at home in seconds. Having a slide in the office to travel between floors helps too! playing from speakers on the palm tree-lined routes between buildings (we heard Thin Lizzy and U2 in the mix), to the on-tap orange juice and fresh-brewed coffee, to the incredible Hub, a place for ViaSat team members to connect, eat and relax in the sun. And the sun? We’d timed our visit well because, after having endured some days of rain and grey, our Californian friends brought the SoCal sun back for us. And it was just perfect. We made super progress in planning how best we can work together over the coming years, to tell our incredible story to the airline industry. Watch this space (or sign up for our newsletter here) and we’ll keep you posted on the many awesome developments that are in the pipeline. And if I was to sum up California and ViaSat in one word, it would be that: Awesome. Learn more about our portfolio of operational apps, wireless IFE and in-flight internet for airlines. All pics by Arconics crew. Gary from the Arconics crew outside Building 1. 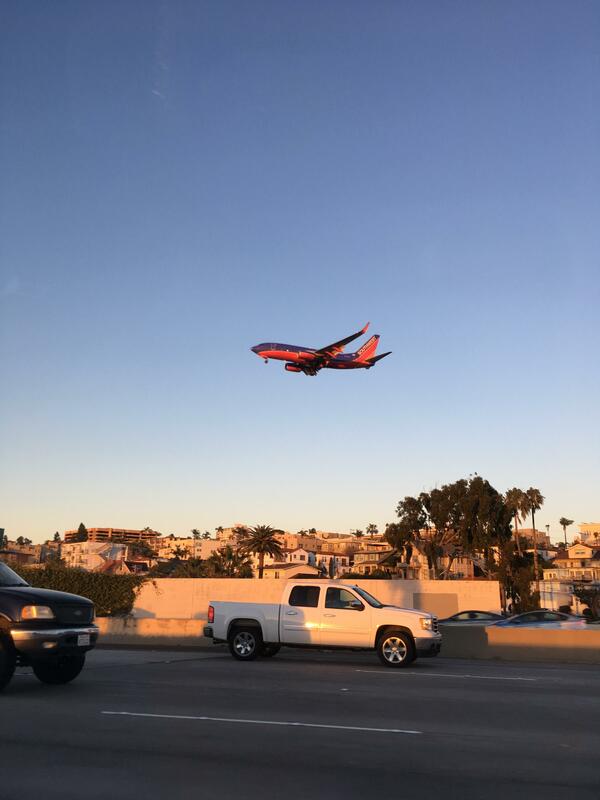 Southwest B737 coming in to land at San Diego airport (SAN). 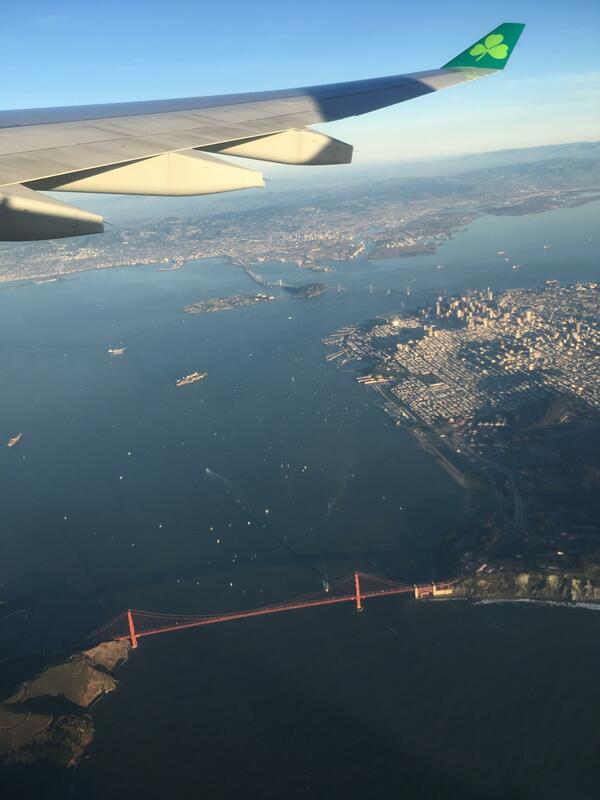 View of Golden Gate Bridge, departing SFO on Aer Lingus A330. AeroDocs EFB, Airline Document Management. Flight Ops, Rome.